What's the price of a little extra style? People love these Spanish-style houses. 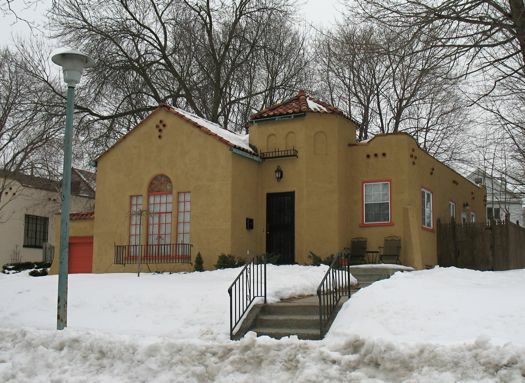 The TU looked at the backstory on the Spanish-style houses that are somewhat unexpectedly clustered on a few streets around Albany (Hansen, Woodlawn, Main, Rosemont, Greenway). People seem to really love these houses -- and how could they not? They're stylish. They're cute. And judging from the few we've been through, they have some great (if small) spaces in them. OK, so people dig these houses. But how much? Well, we can make something like an educated guess by running a few numbers. How much does one of these houses go for? In that TU article, the owner of one of the houses on Hansen mentions they usually sell for between $220,000 and $240,000. Hmm. That seems maybe a little high, considering one of the houses on that same street went for $182,000 last year -- though that house only had one bathroom and it's a bit on the small side. On the next street over, there's a Spanish-style (3 BR 1.5 BA) currently on the market for $215,000 -- but it was sold just last year for $234,000. OK, so let's just go with $215,000. How big are these houses? It looks like most of them range between 1,350 and 1,450 square feet. So, let's go with 1,400 square feet. Now, let's compare that to the average price per square foot in the neighborhood surrounding these houses. Trulia, a real estate site that tracks this kind of data, considers Hansen and Woodlawn to be part of Pine Hills -- and it reports that neighborhood has an average price square foot of $98. The thing is, Hansen and Woodlawn are right on the border of that neighborhood and they probably have more in common with the next section over, which is the New Scotland neighborhood. Trulia lists that 'hood at $134/sq foot. Another cluster of these Spanish-style houses is in the Melrose neighborhood, which Trulia pegs at $120/sq foot. Hmm. Well, let's just pick a point in the middle: $127/sq foot. So based on this (very) fuzzy math, you could say that people like these Spanish-style houses so much, they're willing to pay 21 percent more for them than a typical house. Of course, there are all sorts of variables that could push things one or way the other: the specific location a house, its condition and market swings are just a few. Also, we made a bunch of guesses based on just a few pieces of data. Your mileage will almost certainly vary. And it would be a bad idea to make any sort of major decision based on these numbers. Based on some fuzzy math using squishy numbers, the Spanish-style houses in Albany are worth about 21 percent more on average than a typical house. An extra $27 per square foot is still far less than the worth of my right arm, which I'd been prepared to part with in order to get a house like this. Those Winchester Houses are some of my favorites in Albany. That and the Lustron ones! I considered buying one that is for sale on Woodlawn right now, but in addition to the selling price, it's the upkeep on these houses that give me pause. Maintaining the houses in their original style (which I think is important to their value and aesthetic) is costly. @chrisck: One of the people in that TU story mentioned that the roof tiles are something like $50/tile. Eek! That's not a cheap roof replacement. Those houses are easily 21% more awesome than your typical Albany house. The one for $215,000 was originally listed for $240,000 I believe. We looked at it then and it needed a lot of work. All of the plaster walls were soft and spongy around the windows. The owner has been re-located for work and had overpaid for it when he bought it (said our agent). Even though the house is beautiful from the outside, it was not worth the $ for us.